WEEK THIRTY-ONE :: SCRAP WITH FABRIC! Upload your page to the SLYMI Reboot gallery, marking it for Week 31 (or Wk31 or #31, but please have a 31 in there somewhere). See how much fabric others have managed to include while you're there - or catch up with commenting on a earlier uploads - you never know what you might find - or who might come and comment on your pages!! Ooo err! That's a challenge for sure! I have an idea will have to see if I can bring it together tomorrow. Here's mine! I have had these material tags for ages, so this was a good excuse to use them! 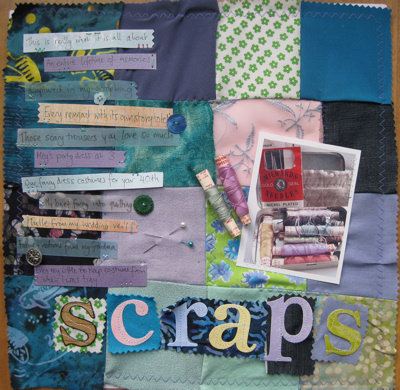 This is my LO for the scrap with fabric challenge. Fabric tape.